Arpeggionome Pro was already getting a fine work out on my iPad controlling other MIDI capable synths and the likes. Now Audiobus support has been added to further expand the apps functionality. Audiobus wasn’t really a necessity since the apps Arpeggionome Pro controls sends the recorded audio through Audiobus to whatever output is being used. It does however make things much easier to do. Triggering the record function while in AP definitely speeds up the process and eliminates extra home button clicks. Personally I really appreciate the landscape view support being added. Choice is good. Don’t underestimate this app. This is a strong piece of software and is worth the cost. 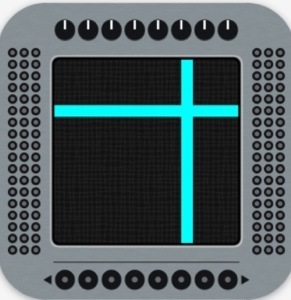 I’ve been looking around for a robust, dedicated Arpeggiator app to add to my iPad music studio. Since I don’t use any midi hardware and have found most virtual midi capable apps less than exciting, they often don’t escape my self induced blind spot. There are some very good ones, and then there are those like Arpeggionome Pro that blow me away. This is one cool program! I am kicking myself for having missed it until now. Arpeggionome Pro is first and foremost a midi controller. It is a very complex Arpeggiator with a full plate of programming capabilities. It has its own built in synthesizer, but very basic. Using this to control any (virtual) midi capable synth is where it at. Thanks to a thoughtful design that inspires easy use, making midi connections is a breeze. Deigned to control pretty much anything midi, Arpeggionome Pro beckons users to put it to work with what ever you want it to control. Quantize first note, use any of the 16 channel sends, midi clock sync, so on and so on. If its midi, Arpeggionome Pro can do it. Making virtual midi connections are effortless and more up my alley for my uses. In no time I was enjoying this marvelous app controlling my favorite synths and crafting some slick arps. The range of arpeggio pattern controls are splendid. Center screen is the performance matrix for primary pattern control by touch to manipulate first triggered note (left & right) and pattern speed (up & down). 6 groups of button matrices and 8 virtual knobs frame the performance matrix. Make pattern adjustments in any size, shape or speed on the fly. Theres no need to stop the flow just to change where it goes, the octaves, gate, speeds etc. Having all the controls right there in your face makes this one very tidy experience. At the top of the screen is also a visual indication of the notes as they are played out on a virtual keyboard. 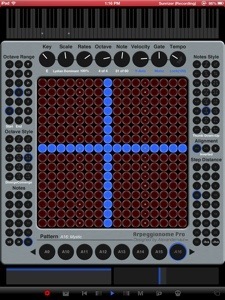 See screen shot below for details on the button matrices and knob controls. For even more details please visit Alexandernaut here! There is a lot going on under the hood. As you can see (from the screen shots) the available controls are not just numerous, but also just a quick tap or slide away. No changing screens, or menus to dig through. One screen with everything. This is designed with consideration to those performing live and with the adjustable accelerometer assigned messages, (like, pitchbend, gate, etc) Arpeggionome Pro becomes a whole new instrument full of expressive possibilities. With the combination of all the available options to make up your own unique arpeggios you’ll soon discover this is all you’ll want for your pattern programming needs. Nothing opens up a greater, more pleasant experience for creating any arps you can imagine. 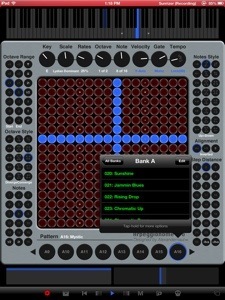 Plus a nice selection of preset patterns to use or build off are included as well. Anything you create can be saved for future use and is quickly accessible via the pattern banks on the bottom of the same screen. Arpeggionome Pro has no record, audio copy, or Audiobus support. Audiobus support is planned. Even without it Arpeggionome Pro can control a synth assigned to an Audiobus input which can then be captured by whatever output you are using. It works fine as is, but starting a recording in an output slot app from the very handy Audiobus remote control would be a nice addition here. If you want something to create specialized and unique arpeggios beyond the usual fare get Arpeggionome Pro and start making some serious arps. This is powerful, fun, and creative. All packed into an intuitive interface that works with you. This is a masterpiece in design and functionality. Smashing! 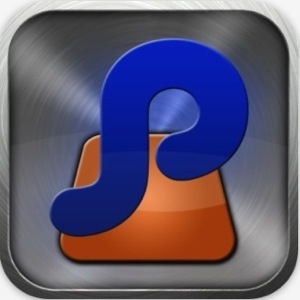 5 stars Click here to buy Arpeggionome Pro in iTunes. *There is also a lighter version called simply “Arpeggionome” with fewer features at a smaller price. This Part 2 in the series of reviews looking at Auria’s FX and Plug Ins focuses on the Delay/Echo & Chorus effects available in Auria. Is there an echo in here? Auria sure has plenty of options for your delay/echo and chorus FX needs. Some are packed in at no additional charge and offer high quality FX to suit most needs. A few others (maybe even more to come?) are available with more specialized functions featuring even greater depth and quality to your arsenal. All of them are unique and determining whether or not you might need to buy more can be confusing. I hope what follows will provide some assistance in your quest for the best FX for you. Remember all FX and Plug Ins can be automated in Auria. Starting with the factory FX that come with Auria followed by the additional options you can purchase. This unit provides a nice stereo delay effect ready to go. There isn’t much to say about this that most people probably don’t already know. Its a very solid delay unit. 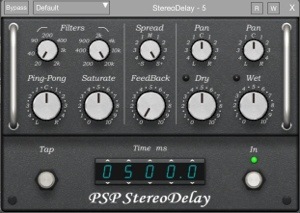 Complete with all the standard controls this StereoDelay delivers that perfect delay FX for general uses. It has a great wide ping pong delay effect. Very nice sustain characteristics. Hi and Low filters, independent pan controls. Spread, Saturate, Feedback, Wet, Dry mix, and Millisecond time control. Its not too hard on the CPU so you can get a lot more use from it in individual tracks. Another splendid FX unit packed in at no additional charge. 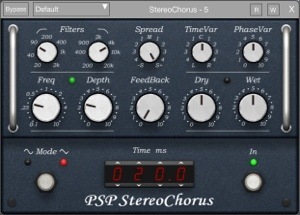 This StereoChorus unit is one of the better I’ve heard in all of iOS. 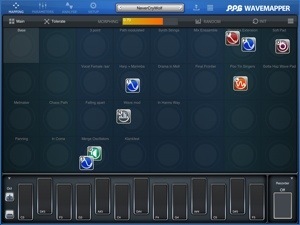 It features a solid amount of customizable controls to add lots of depth to your music. You would be hard pressed to find a StereoChorus of this quality & capability elsewhere in iOS. Most (if not all?) others are just minimalistic and limited in features restricting users options for robust Chorus effects. Not this one. Fantastic for adding a little ( or a lot ) of Chorus swirl on its own or when combined with other FX like the Reverb units. StereoChorus brings a lot of life to all it touches. Like the Stereo Delay, this also has Hi and Low filter controls. Spread, Wet/Dry mix, Feedback and Millisecond controls are included as well. It has some presets for quick use in specific scenarios, or to expand upon. As with all the Auria FX units you can save your own creations for later use. We all need to have a good Chorus FX option at sometime or another. Whether you just want a small Chorus effect or crazy fast wobbly weirdness, this can do it. Having something sounding this good and easy on the CPU is most welcome. Now we’re getting into some really cool stuff. This beautiful Echo unit has muscle. A high quality and strong Echo unit. This time based FX plug in goes beyond typical echoes of this breed. It has unique tape controls like “Wow” and “Ducker” to push beyond expectation fostering a most enjoyable creative experience. Inside is a marvelous emulation of classic analog tape echo FX of yore with 4 simulated mono tape delays. 2 for ping pong pre delay and 2 for the main stereo echo. Two tape slider controls, Tape Speed selector, and numerous ( see screen shot above ) virtual dials for several functions to tweak up some super cool effects. Drilling down into those many parameters can easily lead to effects that have a distinct and original sound indistinguishable from the hardware it replicates. I just love the immeasurable amount of possibilities to craft such a wide range of time based effects that have a classic tape echo character, unlike anything we have seen in iOS. A good amount of presets can be selected for immediate use. 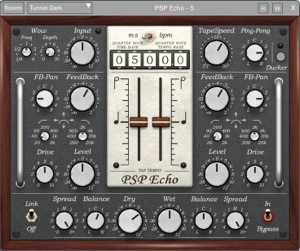 Capable of complex uses, PSP Echo is also very user friendly for all skill levels. Its a powerful plug in, so it uses a bit of CPU. This is a serious sound mangling beast! Not only a hi end tape echo unit, but also excellent for a multitude of effects. Its lovely emulation of analog tape delay is as good as any. High quality filters, time stretching, and modulation expand upon being just a tape echo unit. 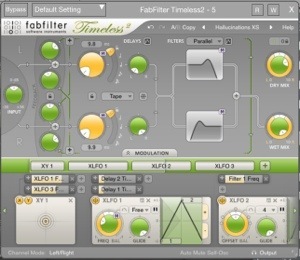 This has a different design from the other plug ins unique to FabFilter that is much more modern in appearance. Drag and drop modulation with the 24 slot modulation matrix and routing with a plethora of tools to make a huge array of effects. 16 Step XLFOs, X/Y controls, envelope generators and followers ready to take your sound to a new level in effects. 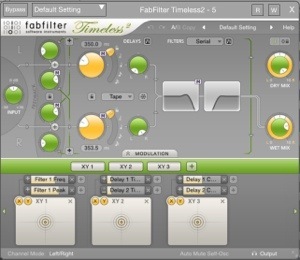 Two multi mode filters with 11 characteristics and filter panning are under the hood. In addition to being an outstanding model of tape echo, it also can be used for Chorus, Flanger, Phaser, Scratch, and whatever you might make up yourself are possible. The large number ( over 300 ) of presets put you on the path to those many effect types. Exploring them is half the fun. Timeless is an amazing plug in. Making specialized sound FX is a breeze with this. You might think with all these effects options it would be a student of many but master of nothing? That would be incorrect. Everything you do with Timeless is of the very best possible quality available. I find this to be extremely useful and satisfying all around. Does that mean you don’t need anything else? No. You do need this however if you want the best of the best for multiple FX types that all sound equally as good. It does however take the biggest chunk out of the CPU, so be aware. Freeze tracks. That wraps up Part 2. I hope you found something useful here. I tried to keep these brief and right to the point without getting too deep into the technical specs. Thank you for reading. Part 3 will come next starting with some FabFilters like ProQ, ProC, etc. TBD. Wolfgang Palm has done it again. 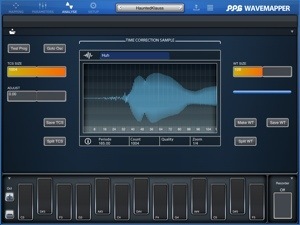 The recently released WaveMapper brings an exciting new way to craft sounds on our beloved tablets. 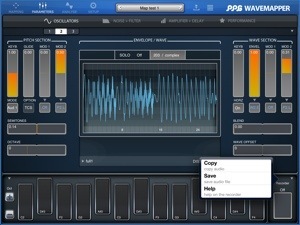 Those familiar with his PPG WaveGenerator will expect nothing short of greatness in WaveMapper, and they will get just that. This new synth will be a grand addition to your iOS synth library offering a very deep, complex, and fun way to create any kinds of sounds. 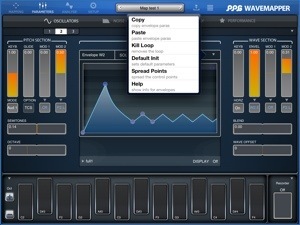 WaveMapper uses a whole new method of building synths from its Sound Map. The Sound Map is a wonderfully easy to use table for the user to literally map out sounds. 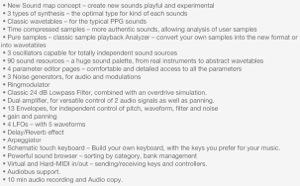 Improving upon WaveTable synthesis WaveMappers new design allows you to map these sounds into new wavetables that can be manipulated and formed into whatever you might want to hear. As you move the various icons representing the sound modules (3 oscillators, Filters, LFOs, Noise and so on) across the map of programs, what you hear will evolve. Instant gratification! You can tell just by looking at the above screen shot that the possible combinations available will easily unlock a wide array of sounds depending on where each module is hanging out among the many programs. Furthermore each program ( up to 32 can be used of the 90 sound sources, instruments & wavetables ) can be changed or removed however you like by a double tap on either the module icon or the program square. The exploration factor is really something to behold. It matters not what your experience level is. 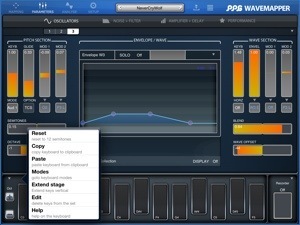 This synth is extremely easy to use, and has the complexities to satisfy even the most demanding of synthesizer fans. Play the presets to your hearts content, or dig in to the numerous programs carefully tweaking the synth parameters for just the right sound. If you can’t think of anything, you’re going to really appreciate the “Random” feature. Personally speaking I’ve found this to be highly entertaining. You never know what sound might show up to the party. Don’t you just love surprises? You’re not restricted to building from just the factory samples. For some reason though the only way to bring in your own sample is through the ever so dreadful iTunes File Share via the app documents folder. Based on the (From PPG) comment below this review, it appears AudioPaste will be supported. So file share is only a temporary concern. Its a big bonus that you have the option to take a sample of your own to be formed in to a new wave table or format. This is easily done from the “Analyze” screen, and is very handy for crafting some pretty cool stuff all your own. That seriously opens up even more possibilities for making one of kind synth patches. Patch saving is easy. Once you’re done fiddling with all the oscillators, X/Y velocity controls, modulation, routing, and whatnot just tap the button that looks like a pen pointing at a piece of paper (sort of?) and select “Save As”. You’ll find other options to save, or initialize patches in the same drop down menu. WaveMapper of course has all the expected adjustable synth parameters to fine tune your patches. For those familiar with WaveGenerator it will be nothing new. If this however is your first PPG, don’t sweat the absence of virtual knobs, and dials. The controls are all there in various other forms like sliders. You can’t get lost, but if you do there is integrated “Help” at nearly every corner inside WaveMapper. Not to mention a link to a full and detailed manual. If after all that you still can’t find the answer, try emailing support. They are very helpful. If after all that you still don’t get it, well…um…how the heck did you manage to even turn on your iPad? As far as sound design goes this is a pretty monster. You can set it up to be controlled by MIDI and virtual MIDI. The keys are a little tiny (but can be expanded now) making this a bit challenging to play at times. No problem just plug in your portable keyboard/MIDI controller and play away. WaveMapper was the final straw ( or inspiration ) in my breaking down and deciding to finally get a portable MIDI keyboard. It also has a nice little customizable arpeggiator built in. The same arpeggiator found in WaveGenerator. There are a lot of things to list out feature wise. Check out the screenshot below for some of the bullet points, and or visit Wolfgang Palms website for all the specs and glorious details. 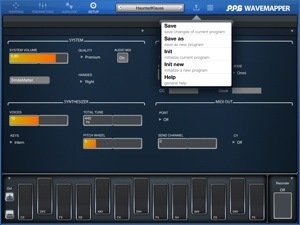 In case you missed it, WaveMapper is Audiobus compatible. Ive been testing that out a quite bit and so far it handles Audiobus very well. This may depend on your device though. My experiences have been exclusive to an iPad 3. If you don’t have Audiobus yet ( Why?) WaveMapper can record up to 10 minutes, and you can AudioCopy/Paste to your favorite iDAW. I honestly have no serious complaints. V 1.0’s are often a little buggy. WaveMapper launched polished up very nicely all things considered. Bugs happen, and what very minor issues there may be today, will soon be corrected. No worries. WaveMapper is blissfully satisfying. In many ways an improvement over WaveGenerator, while also promoting a more user friendly experience for very complex patch making thanks to the sound map. This is truly a must have synth. 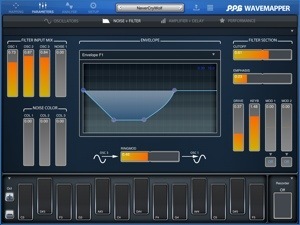 One of the very best synths you can find in all of iOS. Just get it, and you’ll see. Click HERE to goto iTunes App Store to buy this beauty. 5 Stars. Must Have Instant Classic. Here’s a couple more screenshot shots. Guitarism now supports multi channel -MIDI! This new feature is called “Triple Play” and is available as an IAP from within the app for $4.99. That might seem like a high price just for MIDI, but consider that the app itself is only a mere $2.99 as is, and has a quality sound with fantastic playability. Triple Play adds a lot more depth and functionality than it might seem at a glance. Being able to control up to 3 MIDI compatible apps simultaneously is really cool. Once you start using it, and experience just how inspiring it can be, the value becomes much more evident. I have to be honest though, I think the five bucks IAP is a little high. I’d feel more comfortable with it being a couple bucks less, or better yet a full Guitarism package with all the goodies for single price. Say $6.99? Nevertheless, its not my business to argue pricing, I’m just voicing my own opinion. By the way I want to direct you to the comments of this review to consider a strong argument for the value of this apps IAPs, that Rhism himself pointed out. He makes good sense and points out a reasonable comparison vs other apps with similar and higher priced options. However you look at it the functionality you get is compelling. This is a solid and quality guitar simulation app that isn’t developed on a whim overnight. Its a serious instrument that delivers a wonderful experience, and with Triple Play a whole world of new possibilities open up. Guitarism with Triple Play are a powerful combination. 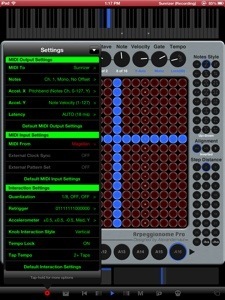 Why are so many virtual guitar apps in iOS being sold without Audiobus or at least AudioCopy? Rhism LLC gets it. 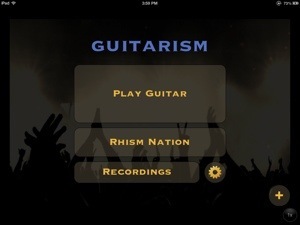 Developed by a guitar player, Guitarism comes not only with probably the best sounding virtual guitar, but also a comfortable playing interface built perfectly for iPhone and iPod touch. Plus, he made Guitarism relevant by adding Audiobus support quickly. 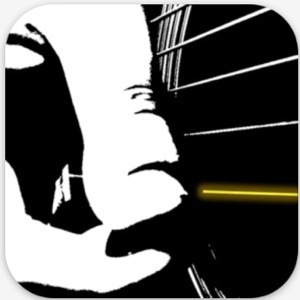 The first virtual guitar app to do so. Guitarsm is a six string virtual acoustic guitar with an amazingly playable design. 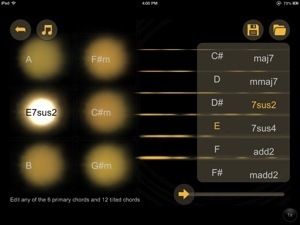 It sounds fantastic and as close to a real guitar sound as any other app. The quality of this is amazing maybe even better than other iOS virtual guitars. You play Guitarism with two hands, and depending on if you’re a lefty or righty (both supported) the chords are on one side while the string strumming is on the other. Guitarism is centered on strumming most of all, but you can finger pick individual strings without discomfort. 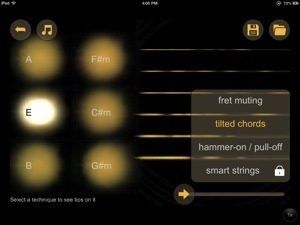 For some reason Finger Picking (Smart Strings) is available through IAP. I feel that’s a standard function and should be part of the entry price. A very clean and simple interface intelligently designed awaits. No clutter or any unnecessary menus. This is strait up 6 string strumming pleasure. There is of course a menu of options to offer further tools to make the most of your experience. Change and customize keys and scales how ever you prefer. 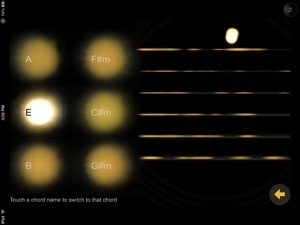 Turn on Tilted Chords and your 6 available chords expand to 18 variations by simply tilting the device left and right. Very nice option, I can’t turn it off. Further expanding on expression options are Hammer On and Fret Muting which can also be enabled. These are the kinds of features any guitarist would expect. Having these makes playing Guitarism about the most instinctive and natural feeling of any iOS Guitar I’ve tried. I cant say it enough. The sound is very good. The strings respond magnificently to how you hit them. Gently strum or tap for softer sounds, or rapid taps and fast strumming for much louder responses. The string attack is incredibly lifelike. There is a nice amount of sustain that lends to the natural quality of what’s played. It could probably benefit from a selectable option for users to expand or reduce the sustained audio. Just something I’d like. Guitarism has its own record option, and a recordings management folder. No FX come with Guitarism, but neither do real guitars. Thanks to Audiobus support, playing Guitarism through FX apps like EchoPad (really gotta try it!) is a fun and easy way to add some very cool FX, and have it all recorded in your favorite iDAW. AudioCopy is supported as well, in case you’re without Audiobus. More additions are being developed to improve and expand upon Guitarism. A couple notable planned items are: More guitar types, & MIDI. Both planned to be made available through IAP. iPad native support is being considered but has not been confirmed. Its possible a separate app might be needed for iPad. I hope he finds a way to make this universal, no one likes having to buy the same thing twice. Personally speaking I am excited by the possibility of having a 12 string added to this. I can hardly wait to see what Rhism does next. For the record I’ve been playing this on my iPads 2&3 at 2X size without any problems at all. This is one well made and great sounding virtual guitar. No complaints. A new must have. 5 stars!